All the other Who's Who entries have new art, but they gave poor Arnie a cut-and-paste job. The foreground figure is from the cover of Detective #306 and the background is a panel from House of Mystery #153. I think "Criminal Scientist" should have been listed as a career option in all those career path tests I had to take in high school. Do you have a list of villains by number of appearances? 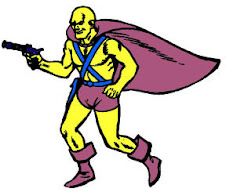 For silver age standards 3 appearances makes Hugo a recurring villain. I find it very odd that they didn't use him in the 90s, specially considering he fought Batman and got his Who's Who bio. Rafa, Prof. Hugo suffered from what I call "The Who's Who Effect," where creators often unfamiliar with Pre-Crisis DC Comics relied upon the most readily available resource material to craft their stories, excluding all else. Hugo was not in Who's Who, and therefore wasn't in a comic book for over forty years. J'Onn fought Prof. Hugo in four stories, which is twice as many as Commander Blanx ever appeared in. Hugo also fought Batman in his debut, and the Super Friends a few years ago. 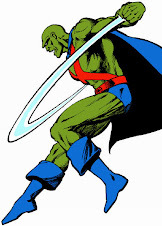 Despero has fought J'Onn in at least 20 individual comics, a low and quick estimate. 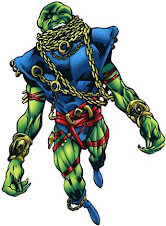 In terms of story arcs, that includes their chess match from the early '80s, their defining showdown in early '90s JLI, their two matches in the New 52, and that Identity Crisis tie-in story, all of which were actual grudge matches rather than Despero vs. JLA teams J'Onn happens to be serving on. 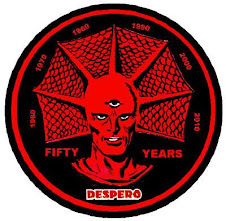 In raw numbers, Despero is the archenemy. 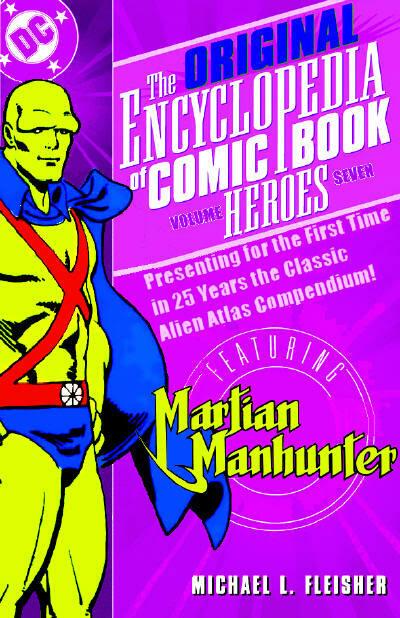 Beyond that, Malefic has appeared in 21 comics, and every one of them was primarily as an Alien Atlas antagonist. The forces of Apokolips, including Darkseid & Kanto, have gone after J'Onn specifically about eight times. 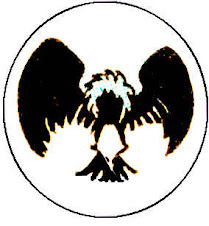 D'Kay D'Razz managed 7 original appearances as a foil, Cay'an was behind the scenes throughout the 2008 mini, Bette Noir's in 4 books, and Bel Juz turned up in about 3 comics. Gorilla Grodd & Vandal Savage have each gone one-on-one with J'Onn a few times. 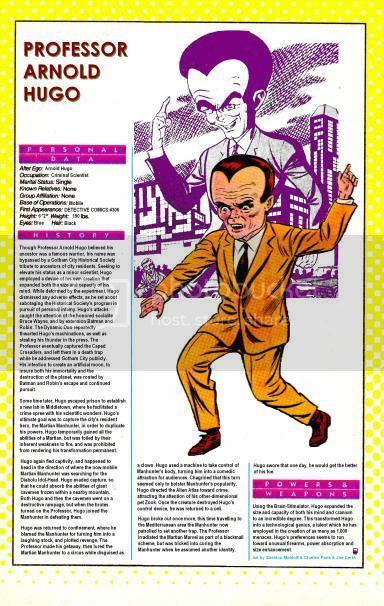 The two biggest historical foes are Mr. V with 11 Silver Age run-ins and Diabolu's Idol-Head couple of years worth of misadventures. Five appearances is not that bad for silver age standards. I guess the 70s were pretty bad on J'Onn's villains. During the 60s Mr. V, Diabolu and Hugo kept a good score. I find Hugo's appearance interesting. He looks like some 60s middle-aged lawyer with a big head. It is known that the character of Egghead was inspired by Barney Barrows, I wonder if Professor hugo was part of the inspiration as well.